The clip library is the core of Silverstack. It easily enables you to inspect all the metadata of your clips and let you organize all your clips by these metadata. During offload and backup all clips and files plus their file copies are registered in the Silverstack’s clip library. Over time using Silverstack in your production you always have access to these clip metadata which refer to your project based media files. During all organizing and editing tasks Silverstack never modifies the data of the original and their backups but saves all changes separately. A lot of clip metadata like resolution, reelname, or exposure is already added to your clips by the camera and is therefore not editable. Non-technical metadata like scene/shot/take information however can be edited but is not stored within the original video files. Instead Silverstack saves this editable information and links it to the corresponding clip file. You can add a lot of this supplementary metadata very easily in Silverstack. You can edit metadata in the Silverstack Information panel, in the “General” (figure 1 #1) and “User” tab (figure 1 #2). Information edited in the “General” tab can be applied to several selected clips. For doing so, click on the small pen symbol (figure 1 #3) right to the metadata field. Make your desired changes and enter the information by clicking “Apply”. Metadata like comments, ratings, flaggings etc. can be edited in the “User” partition (figure 2) and affect exclusively the currently active clip. Flag: By flagging a clip (figure 2 #1) you brand it with a flag symbol which can be interpreted individually. Rating: You can rate each clip (figure 2 #2) by assigning a range of zero to five stars to it. Comment: Save important information regarding a clip by commenting (figure 2 #3) it. Label: Each clip can be labelled (figure 2 #4) and thus be categorized. Each label in the drop-down menu can be edited in the application preferences. You get there pretty fast by clicking on “Edit..” in the drop-down menu as you can see in figure 2 #5. Cue Points: The cue points table (figure 3) shows all set markers for this clip (#1). For a better overview of your markers, within a clip you can assign each marker to one of a set of predefined categories (#2) and also search for them (#4). You can add new markers, delete existing and jump to the next by the buttons in the lower left corner (#3). To inspect, edit, and add metadata you can use the information view. To activate it switch the view on the left from “Library” to “Information”. 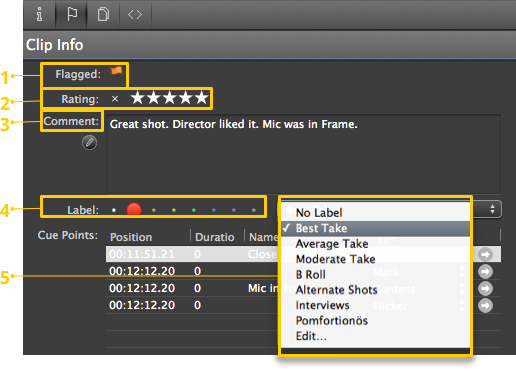 Silverstack’s clip table view is a great way to get an overview of the various metadata of a set of clips. Some of the fields are editable and you can jump from field to field by pressing the TAB key. Secondary click on the table header to show or hide metadata fields. You can also rearrange table columns by dragging the columns headers. The more metadata you have added to your library the better you can use it to organize your clips using some metadata attributes. You can query all metadata fields by using the search field in the upper right of Silverstack . To search for cue points use the search field at the bottom of the “User” tab within the information panel (figure 3 #4). Smart folders are folders that show all clips that match some criteria. Silverstack creates some smart folders by default like “Registered today” a folder that contains all clips that were added to the library today. To create your own smart folders, just click on the “+” button in the lower left and choose “Add Smart Folder”. You can now specify the criteria a clip has to fulfill in order to be added to the smart folder. 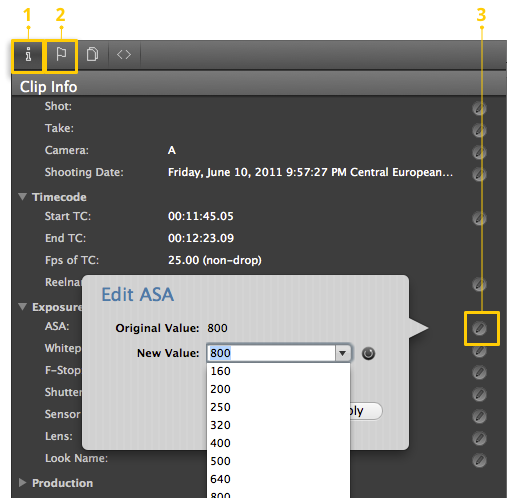 If you are adding more than one filter option, you have to choose if the clip has to fulfill only one or all of it. The example above show a simple smart folder showing all the clips that are flagged and that were registered during the last week. Reports – Create a report that contains an overview on all clips and save it as pdf/html. CSV, XML – Create files that you can import in spreadsheet applications like Excel or Numbers. Or write your own scripts to process the data. Transfer to Final Cut Pro – Get your clips and the metadata into Final Cut Pro 7 and X. 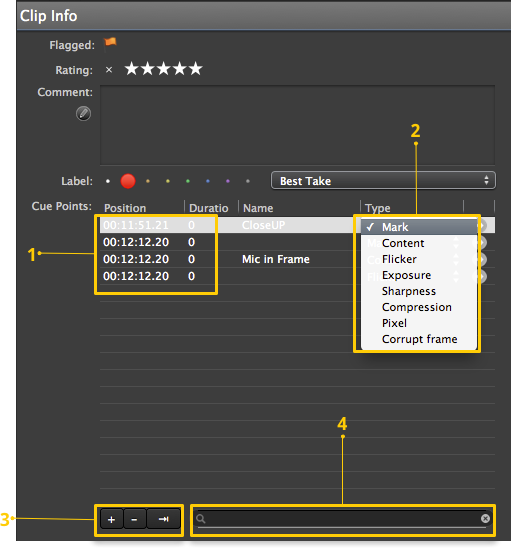 Transfer to AVID Media Composer – Get clips and metadata into AVID using ALE files. For further information about the Silverstack “Transfer” function go to the respective article Transfer. Note: Not every transfer format can carry the same amount of information. That is why metadata workflows differ from format to format and thus from tool to tool.